Composites that simultaneously combine light weight with high electrical and low thermal conductivity are very desirable for aerospace, marine, and energy applications but are hard to achieve in practice. 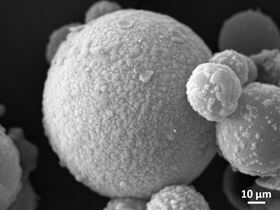 Now researchers think they may have the answer in the form of hollow glass microspheres covered with carbon nanofibers, which can be used as a filler for polymer composites [Herrera-Ramírez et al., Composites Science & Technology (2017), doi: 10.1016/j.compscitech.2017.08.020]. Hollow glass microspheres are well-known additives for polymer composites because of their light weight and low thermal conductivity. But the lack of interaction between glass microspheres and the polymer matrix reduces the composite’s strength. Carbon nanotubes and fibers hold promise as fillers for polymer composites because of their electrical conductivity. To get just the right balance of properties, the researchers sought to bring together the best attributes of each of these fillers in one material. “We decided to combine the low thermal conductivity of hollow glass microspheres and the high conductivity of carbon nanotfibers to try to make thermal shields for aerospace applications,” explains Roberto Guzman de Villoria of FIDAMC, Spain. But rather than just add the two fillers to the polymer individually, the team from FIDAMC and IMDEA Materials Institute created a novel hybrid filler. The researchers based the hydrid fillers on hollow microspheres, 20-100 microns in size, made from soda-lime-borosilicate glass. These they covered with carbon nanofibers using chemical vapor deposition, before embedding in a polymer matrix (urethane acrylate resin). “By growing carbon nanofibers directly on the surface of hollow glass microspheres, we do not need complicated techniques to disperse the nanofibers in the matrix so we can mix them as a standard microfiller,” points out Guzman de Villoria. The resulting composite is easy to process, light, has low thermal conductivity, and is electrically conductive – a unique combination of properties for a polymer-based composite, the researchers believe. “These materials would be useful where low thermal conductivity and high electrical conductivity is required, such as thermoelectric devices which currently rely on expensive materials,” says Guzman de Villoria. Other applications could include electromagnetic interference and temperature shielding materials for electronic equipment. “If we could obtain composites with higher levels of electrical and lower levels of thermal conductivity, they would be attractive as lightning strike protection for aircraft, electrostatic coatings, EMI shielding, and thermal insulation,” he adds. The researchers believe that their approach could pave the way for a new generation of hybrid fillers to bring novel combinations of properties to composites.